You see, Shikantaza is to be sat with a sense that there is nothing else but Shikantaza, nothing more needed or which can be needed outside the act of sitting Shikantaza itself. Shikantaza is a ritual enactment of Buddhas sitting as Buddhas, embodying the peace and satisfaction of "nothing more to attain but this" which only Buddhas can know. It is a "non-self fulfilling prophesy" which becomes complete when we sit it with the conviction that it is complete. The mere act of sitting itself is to be known in the bones as the completion of the universe, the fruition of life. No kidding, no exaggeration. There is not one drop outside of sitting to be desired, nothing lacking, nothing more to attain. Simply sitting this sitting is whole and absolute satiation of all desires, the one action needed in all space and time in that time of sitting. It is the only place to be or where one can be in the world. One should let the thoughts go, with the mind and body upright yet not rigid. One sits in a balanced posture, one allows the breath to take a natural rhythm. The mind should rest in equanimity. But beyond that basic form, nothing more is sought or demanded whatsoever. In sitting, one may experience various degrees of peace, clarity, stillness or concentration, and the walls of self and other may soften or sometimes fully drop away. Yet, as counter-intuitive as it sounds, none of that is necessary, nothing like that can be the goal or point at all. Such states and attainments which do arise are never the purpose of sitting, are something like 'side effects,' are never pursued at all. For this reason, Shikantaza is simply unlike any other form of "meditation," let alone most of our ordinary human life filled with endless needs and pursuits, where something is constantly missing or broken and something must be attained or fixed. In Shikantaza, there is nothing more that need be attained, not one flaw to fix, no question which is not fully resolved in the mere act of sitting. This sitting is just sitting that is sitting as sitting, free of any "I" that needs "something more" apart from sitting. When Master Dogen returned from China, such was the special twist which he placed upon the meditation forms which he had learned. (Thus his rejection of Zhanglu Zongze’s "Guidelines for Seated Meditation" and other popular Silent Illumination meditation manuals of the time). Such very freedom from further need and abandoning of pursuit is, in itself, the attainment of a most special state of peace and satisfaction which can only come from dropping all need for pursuit! It is the freedom and peace which only a Buddha can know. The wonder of Master Dogen's "Just Sitting" is that this very completion and radical dropping of all need to attain is, by that very fact, the key to Peace and "Seeing the Nature" which can only be realized in the very completion and radical dropping of all need to attain. Clarity will be known. Wisdom and Compassion manifests which carries off the cushion. Wonderful insights may be had, as well as crystal moments of oneness or abiding bliss. Openings, ranging from shallow to boundless, will all timelessly happen, as well as very deep states of Samadhi concentration. However none of that is, and it must not be, the point at all. There can be no other point besides sitting, and sitting is the point that sweeps in all of time and space as its own singularity. For this reason, any form of Zazen or meditation (even if superficially resembling aspects of Shikantaza) which aims for concentrations states, peace, bliss, clarity, feelings of oneness, Kensho (Seeing the Nature") experiences, mystical insights or anything at all --- you name it ---- cannot be Shikantaza. Period. Recently, some folks have posted various meditation instructions, books and descriptions from other traditions. They are wonderful traditions, of course. But to the extent that their emphasis or aim is on reaching any other state or experience, rather than on the wholeness of sitting itself, then such meditation is not Shikantaza Zazen. Case closed. Pack it up. There are descriptions around of meditations they call "shikantaza" or "just sitting," but unless there is present this radical attitude of Master Dogen, it is not "Shikantaza" or "Just Sitting" despite the name. It will lack the power of Shikantaza, No apologies for being such a fanatic for our special Soto Ways. Last edited by Jundo; 05-30-2018 at 04:16 AM. Always good to be reminded. Thank you. Wonderful, Jundo! Nice to see everyone again. No apologies for being such a fanatic for our special Soto Ways. ...Dogen admonishes us to be mushotoku, without expectations or income. It's very strict. Our zazen, study, work, all the activities of our daily lives are our practice. We should do them as the practice of this moment without expectation of result or reward in the future. Just put our whole energy into this moment and results or fruits will grow naturally. I've found this approach so refreshing and such a relief. It is so profoundly different from the constant pressure in America to be productive and strive for more more more. Last edited by Ryushi; 05-30-2018 at 02:13 AM. We humans are always looking for things, to achieve, to gain. To me Shikantaza is to drop all searches and just sit. Pretty simple. So simple and elegant that one needs a ton of words to make people realize this. Very deep here. I'm still wondering what the difference between the phrase "just be" and shikantaza Zazen is. I am still working through the beginner videos though. About half way through at this time. I do not want to quibble about words, but let me toss this in. "Just Be" seems to advise to just be totally in the moment, forgetting past and future. We allow the moment to be just what it is, sick or healthy, rainy or sunny. This is a vital aspect of Shikantaza, and what we do while sitting. But Shikantaza is a little more than that too, as we sit with the conviction in the bones that there is no other place in the world that we can be, better should be, need to be or would ever want to be. Shikantaza is the one action to be doing in that moment that is needed to do in all the world to make the world right. Shikantaza is the conviction that, just by sitting Shikantaza, there is nothing lacking and nothing to fix, all made whole and complete merely by the act of sitting. There is something about such sitting that shines and transcends sickness and health, both sun and rain. It is a breath of fresh air in this life in which we think there are always faults to find, problems in need of fixing, places to go, things in need of doing to make life better. Very simple. By sitting, there is nothing more to make better while sitting. Then, getting up from sitting, there is still nothing more to fix or make better even as we get to work fixing and making better. Last edited by Jundo; 05-31-2018 at 04:43 AM. The body should be settled and stable, so you can breathe with awareness, and tension should be released from the entire mid-section of your body. Think no thoughts of good or evil. When a thought arises – be aware of it – awareness dissolves the thought. As you keep on practicing in this way over time, thoughts are set aside and oneness is attained. This is the heart of seated meditation. It makes me wonder if Dogen thought that talking too much about what your mind should be doing during zazen was actually counterproductive. The bolded text, however, reminds me a LOT of the suggestions from the beginner videos. We can't exactly dig these guys up and ask them what exactly they were getting at, so I guess it will remain an enigma. I just found it very interesting that the "thinking of not-thinking" section of Fukanzazengi is seemingly the most difficult thing for modern newcomers to figure out, probably often chalked up to how people back then may have just spoken and thought differently, and yet Dogen's predecessors (or contemporaries?) had more specific instructions that modern teachers provide. Last edited by Kenny; 05-31-2018 at 01:53 PM. It is much more than a rewrite. He was obviously working from it, but then made extensive changes. Dogen borrowed the sections on the mechanics of sitting, but completely rewrote the sections on the spirit and attitude of Zazen, the purpose and spirit. The changes are fascinating. He did write quite a bit in Fukanzazengi about what to do with the mind. like that between heaven and earth; once the slightest like or dislike arises, all is confused and the mind is lost. any good or evil whatsoever. Whenever a thought occurs, be aware of it; as soon as you aware of it, it will vanish. If you remain for a long period forgetful of objects, you will naturally become unified. bodhi. The koan realized, baskets and cages cannot get to it. Shikantaza is the superior, superlative, best way of Zazen, better than any other ... for me and for those for whom it is the superior, superlative, best way of Zazen, better than any other. For other people, some other way of Zen Practice, Buddhism or other religion (or no religion altogether) may by the superior, superlative, best way, better than any other. For those people, Shikantaza may be a bad way. Shikantaza is "Complete, Boundless and Unlike All Else Period End of Story" in just the same way that every mountain and grain of sand is "Complete, Boundless and Unlike All Else Period End of Story. " I just want to be clear on that. However, when we sit Shikantaza, one sits as all the universe pouring into and from every mountain and grain of sand. Understand? I do not understand. But I did just right a post months beginner's thread that may shed some light as to where I'm at? Thank you. Expressed so clearly for me. This is why I sit. This is the reason why I love Treeleaf. A big bunch of zen nerds. Thankyou for sharing this path and teaching, and thankyou to all living this lifestyle and manifesting thiswisdom. You see, Shikantaza is to be sat with a sense that there is nothing else but Shikantaza, nothing more needed or which can be needed outside the act of sitting Shikantaza itself. Clarity will be known. Wisdom and Compassion manifests which carries off the cushion. Wonderful insights may be had, as well as crystal moments of oneness or abiding bliss. Openings, ranging from shallow to boundless, will all timelessly happen, as well as very deep states of Samadhi concentration. However none of that is, and it must not be, the point at all. There can be no other point besides sitting, and sitting is the point that sweeps in all of time and space as its own singularity. For this reason, any form of Zazen or meditation (even if superficially resembling aspects of Shikantaza) which aims for concentrations states, peace, bliss, clarity, feelings of oneness, Kensho (Seeing the Nature") experiences, mystical insights or anything at all --- you name it ---- cannot be Shikantaza. Period. Thank you for sharing. This reminds me about the moment I realized this: a while ago I was surfing the web trying to figure out the meaning of the various rakusu colors. At some point I stumbled upon a website where a Roshi was shown (I forgot his name) in two pictures. In the left picture he was wearing a western style suit and in the right picture he wore the traditional priest robes. Both pictures were taken during zazen. In the description it said something along the lines of that it doesn't really matter what he wears. While making lunch that same day, it suddenly struck me like lightning: attaining enlightenment or kensho is impossible. How can we attain it if we already have Buddha nature? The whole experience made me laugh and cry, and I started to see everything, including shikantaza in a new light. There is nothing to attain because we already are. I had been chasing an expectation I didn't understand. When I watched your third video for newcomers about posture, breathing, and mind it made sense when you said "if your zazen isn't going the way you want it then that is your zazen that day." I'm not saying it is easy but being aware of it changed my experience. While making lunch that same day, it suddenly struck me like lightning: attaining enlightenment or kensho is impossible. How can we attain it if we already have Buddha nature? The whole experience made me laugh and cry, and I started to see everything, including shikantaza in a new light. There is nothing to attain because we already are. I had been chasing an expectation I didn't understand. I think Dogen had this this same question. If there is no attaining with nothing to attain then why practice. He answers this question at the very end of Genjōkōan. Practice is the expression of Buddha nature. It is nothing that we have but something that we express. At some point I stumbled upon a website where a Roshi was shown (I forgot his name) in two pictures. In the left picture he was wearing a western style suit and in the right picture he wore the traditional priest robes. Both pictures were taken during zazen. He used to described the underrobes as a formality based on tradition, and sometimes "like dressing up like 1000 year old Chinese people" for a costume party. It is the top robe, the Kesa, that we value as a symbol and embodiment of the Zen Path. Last edited by Jundo; 01-18-2019 at 02:09 PM. Thank you for mentioning Genjokoan. I really have to get back to that. Later on, the moment I described reminded me of Fukanzazengi in which Dogen speaks about practice-realization. It did not make me question the use of practice, but rather allows me to practice shikantaza without secretly hoping for something special to happen. Last edited by Kakedashi; 01-18-2019 at 06:05 PM. Yes it is indeed Nishijima Roshi! What a wonderful coincidence. Thank you for the information on the Rakusku: I did not know this. What does LaH or Lah mean? Here is a link to the information on LAH. Nishijima Roshi was just my style! Respect for the kesa as well as straight-forward practicality. I feel if I were ever to become a priest I would aspire to his way: a modern, professional and approachable outfit with the rakusu or kesa, and of course the full set when appropriate. I have a lot of respect for him and they way he taught you and your Dharma brothers and sisters (if there were sisters*), Jundo. 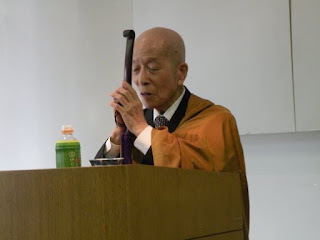 *Are there any current modern female teachers or priests who were taught by Nishijima Roshi? In reading these lovely posts about Shikantaza I am reminded of the comfort of sitting quietly in the early morning, simply being, with a warm mug of coffee. Listening to the silence, maybe still feeling the tug of sleep, fully at peace in that moment. At that moment there truly is no place better to be, to need to be, or to want to be.